There is a lot more than funny shaped baguettes in Le Marais ;-) There is also a lot of art. Hence, this African art exhibition in Le Cloître des Billettes (the Billettes cloister) - a sublime place built around 1430 ! - I love African art so I'm a little biased of course, but I'm sure you will all agree that these sculptures are positively stunning. I wish I had won the lottery and could afford to buy them... See the little video here if you want to know more about this exhibition and about Marie B who made them. This shot is a pure beauty. So beautiful to end my day... I too love the African art. For the third day in a row—still slightly phallic. Just sayin'. :~} Actually, these sculptures are amazing, and your composition shows them off perfectly! However, these are wonderful. Without your disclosure I am not sure that I would have known they were African Art. Great photo! The link to the website and the video is fabulous. The exhibit seems really stunning. I hope I can go and see it. I'm not a fan of African Art, but these are truly lovely. 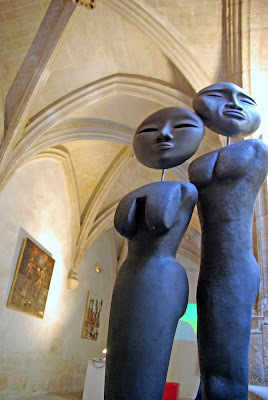 And the juxtaposition of these statues in an area from 1430 -- beautiful. I love the serene faces on the statues. Very nice. I love African art, and what you have shown here in particular. This is such a magnificent shot looking up at the pair and then on to the ceiling. I'm amazed by the contrast between the serenity provided by this photo and the tension I was feeling this morning at work. You know when you force yourself to listen to people in your office and try to understand what they ask you for etc. But that's the job. For sure, that's me too. Those 2 are beautiful pieces. Clean lines, modern ... beautiful. I went there this afternoon. It was very nice to see. Honestly, you really took these sculptures under their best angle. Maybe you'll think I'm a little biased but no, that's positively true!